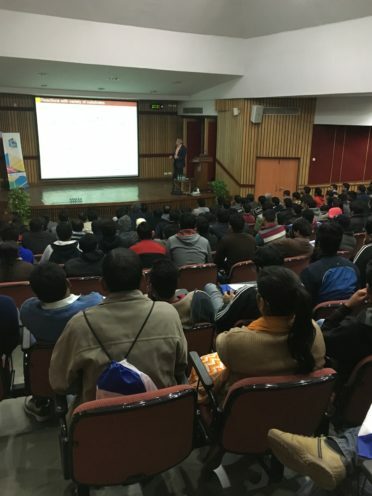 In mid-January 2017, ACS Publications set off to India to meet with local researchers and students while hosting a series of conferences and events. The trip spanned across India, from Mumbai to Guwahati as we learned about the innovative and impressive chemistry research coming out of India. We are thankful for the new friendships and collaborations we forged along the way. The events were a mix of conferences, ACS on Campus events, and receptions which boasted an impressive group of distinguished speakers including Professor William B. Tolman, Editor-in-Chief, Inorganic Chemistry; Professor Krishna Ganesh, Editor, ACS Omega; Professor Christopher W. Jones, Editor-in-Chief, ACS Catalysis; Professor Kankan Bhattacharyya, Senior Editor, The Journal of Physical Chemistry; Professor Bala Subramanian, Associate Editor, ACS Sustainable Chemistry & Engineering; and Professor Partha Sarathi Mukherjee, Associate Editor, Inorganic Chemistry. Our first stop was Kolkata, India for SABIC’s 5th Symposium on Advanced Biological Inorganic Chemistry from January 7-11. The ‘Inorganic Chemistry: Young, Outstanding, and Upcoming’ (IC YOU) symposium was sponsored by ACS’s Inorganic Chemistry. 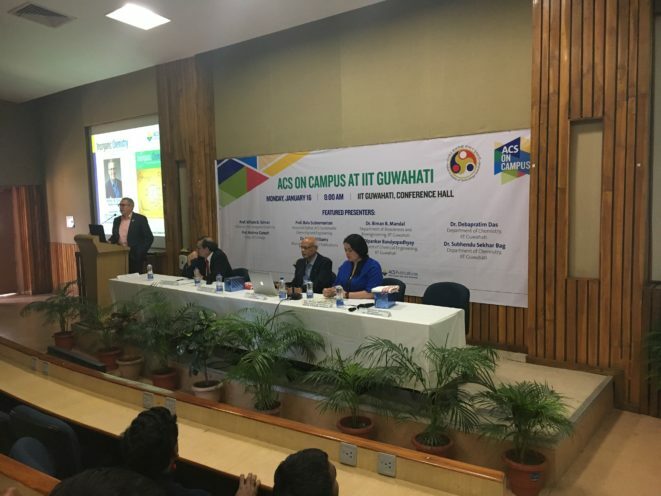 The event was organized by the Inorganic Chemistry Editorial Advisory Board member Professor Abhishek Dey of the Indian Association for the Cultivation of Science, and was Co-Chaired by Professor William B. Tolman and Professor Partha Sarathi Mukherjee. The symposium featured research contributions from young, outstanding, and upcoming scientists from around the globe who are working at the forefront of research in the field of biological inorganic chemistry. On the final day of the symposium, ACS hosted a two hour ACS on Campus session on the scholarly publishing process and science communication. The trip continued with three ACS on Campus events at some of India’s top universities: IIT Kanpur, IIT Guwahati, and IISER Pune. 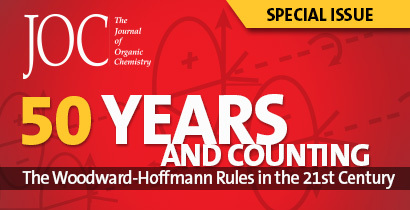 Over 850 students, researchers, and faculty members learned from ACS Editors about the latest innovations in science and tips on getting published and science communication. Highlights included a presentation by Professor William B. Tolman on “How to Give a Good Talk” and panel discussions on “10 Tips for Getting Published” with the editors. During the afternoon, ACS editors from the US and across India provided instant feedback to impressive student and faculty presentations. Events also included networking breaks with the editors. 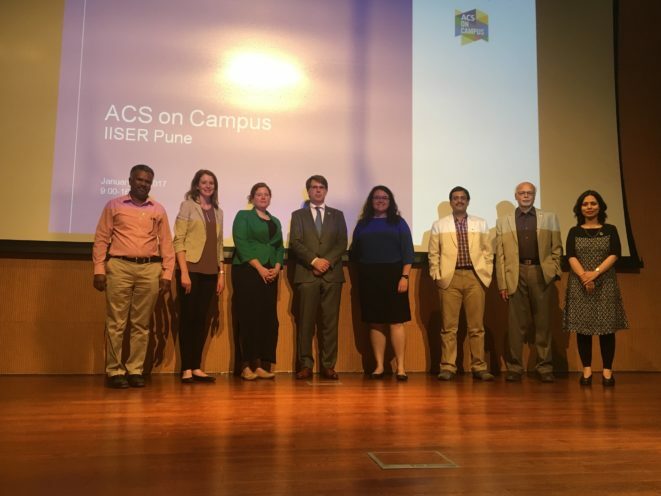 ACS Publications then traveled south to Mumbai to host a ‘Meet the Editors’ session at the Asia-Pacific Congress on Catalysis meeting (APCAT-7) on January 19. The reception was sponsored by ACS Catalysis and ACS Sustainable Chemistry & Engineering and honored our local ACS journals’ authors, reviewers, and readers. The event included appearances from Professor Christopher W. Jones and Professor Bala Subramaniam. 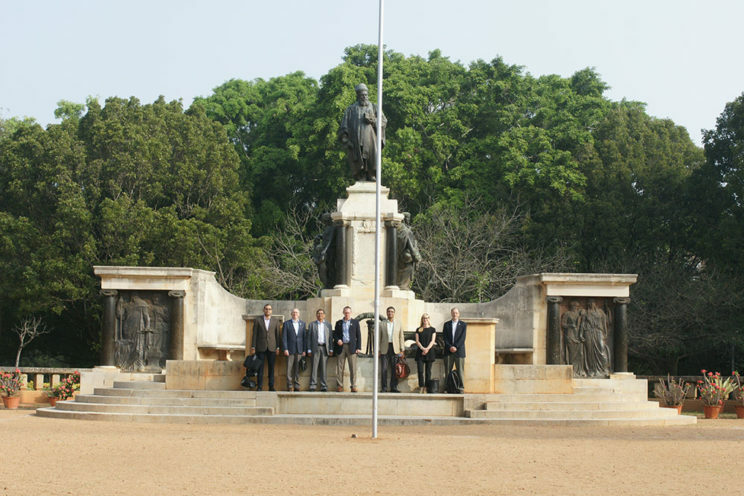 Our final stop in India was the ACS-CRSI Meeting on January 23. This was the first joint meeting of the Chemical Research Society of India (CRSI) and ACS which was held at the Indian Institute of Science Education and Research (IISER) in Bhopal. Approximately 300 researchers and science professionals attended the full-day event. Featured scientific talks were given by Professor RN Mukherjee, Director, IISER Kolkata; Professor Tushar Kanti Mukherjee, IIT Indore; Professor Madhav Ranganathan, IIT Kanpur; Professor Ishu Saraogi, IISER, Bhopal; Professor Chris Jones, Georgia Tech, ACS Catalysis; Professor Krishna Ganesh, IISER-Pune, ACS Omega; and Professor Kankan Bhattacharyya, IISER Bhopal, Journal of Physical Chemistry. An ACS on Campus event was also held in conjunction with the seminar. ACS Publications would like to thank all of our hosts and attendees for their hospitality.